Doubleknot’s membership software supports your unique membership structure and makes it easy for visitors to manage preferences and renew or upgrade their memberships while enjoying members-only benefits. Print-at-home and mobile membership cards are convenient for your members and can reduce your printing and mailing costs. Our membership information is more accurate now, and more people are renewing, because their expiration information and the renewal process is right there online. Read the full Chippewa Nature Center success story (PDF). Read more about Doubleknot's integrated membership management solutions (PDF). Acquire and retain more members through a deep understanding of member demographics and online purchases, registrations and donations. Deliver custom communications that strengthen members’ bonds to your organization. Offer meaningful incentives based on membership level that help recruit and retain members including priority registration, members-only events, online discounts, early admissions and more. Seamlessly integrate online membership sales with The Raiser's Edge and other back-office software. Automatic Online Benefits: After logging in, members will automatically receive the entitlements for their membership level such as discounts and priority registration. Learn more about Doubleknot's integrated discounts and promotions. Gift Memberships: Gift memberships and renewals can be purchased online, and customers can send a personalized message to the recipient immediately or on a specific date in the future. Membership Card Options. 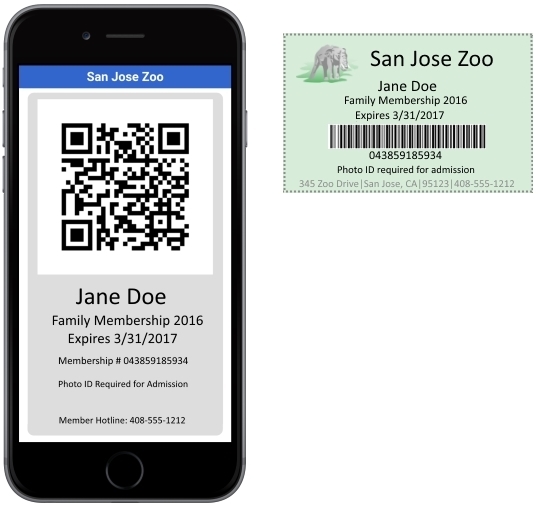 Membership cards can be printed at home, displayed on any smartphone or added to Apple Wallet® or Apple Passbook®. View and Update Registrations, Reservations, Purchases and Memberships: Member purchases are organized in separate tabs by category, making it easy to view purchase history and make updates and additional payments as needed. Maintain Profile and Communications Preferences: Members can view and update their user name, password, address, and other profile fields, and easily opt in or out of online and offline mailings. On-boarding: Automatically send a personalized welcome email or eCard when a customer signs up for a membership. Event Participation History: Member participation in past events is maintained to support recordkeeping, communications, and analytics. Membership Hierarchy: The flexible membership level hierarchy lets you consistently manage upgrade and downgrade rules for renewals. Renewals and Permissions Enforcement: The software automatically handles the enforcement of renewal rules, entitlements, member groups, and permissions. Renewal Alerts: Set up alerts when renewal deadlines are approaching and automatically send customized renewal requests. Membership Search: Administrators can search for member records by any criteria, and save searches for recurring use. Search results can be exported or used to create an on-the-fly mailing list. Historical Member Directory: Doubleknot maintains a list of the prior year's membership information, which can be used to communicate with former members or for other marketing purposes.